So electronic musicians get it, techie people want to hack it and educators can see the applications. But what about you? Why should all play music and how can Skoog help? You have seen the nifty little cube of curiosity and it has piqued your interest, but what’s in it for you? Well…music is not just for the musical! We have got ourselves into a bit of a mess with music as a commodity and whilst technology has delivered incredible accessibility in listening to music, it has done very much the opposite for making it (up until now that is). Music has become something we consume, like ready meals. And in the same way that it’s not good for us to lose our relationship with food – with growing, preparing, cooking and experimenting – so it is with music. We have lost our way. Now don’t get me wrong; I enjoy a ready meal as much as the next person, but it is important to cook for yourself and your family. Going to a restaurant is an experience, a performance. Most of us, though, cannot eat out every night and – more to the point – we should cook for ourselves, even if it is just now and again. Going to a restaurant is like going to a gig or a concert: professionals, experts at their craft, serving up tasty morsels of culture and sustenance that bring us joy. But we also need to be able to cook for ourselves! We need to get our hands on the ingredients, understand where they come from, how they work together (this will actually mean we get more out of our restaurant visits as we marvel at their craft having attempted a soufflé or mille feuille ourselves). And when you make a roast dinner on a Sunday, you don’t wake up on Monday morning declaring ‘I am going to open a roast dinner shop and the world shall feast on my roasts’. The food you made, enjoyed and shared was for you and your friends and family. It was not intended for wider exposure. And it is the same with music. We need to get back to making more of it at home. Not with the intention of forcing it on others, but simply to do it and to share in doing it at home. This kind of social music used to be part of the fabric of everyday life but as we have evolved more complicated ways of making it so we have become distanced from it. We are a clever bunch – harnessing the properties of wood, steel, air and electricity to create ever more fabulous and extraordinary sounds – but in doing so we have made it quite difficult – you might say daunting – to get stuck into a bit of music-ing at home. And technology is not just limited to computers and things with microchips. A flute is technology, as is a drum, a violin or a flugelhorn: you get my drift. But add to this the whizzy array of shiny, blinky gadgetry of today and you have quite palette to choose from and it is hard to know where to start. Computing and computers used to just be for the techie types, but now we all have IT skills, with most of us packing more computational firepower in our smart phones than a computing lab from 1984. We have evolved the interface to these fabulous devices to be friendlier – user-friendly you might say. And that is where Skoog comes in. Yes Skoog is a technologically advanced music device from the future, but it is designed to enable, to empower and, well, to make it easy to get started making music yourself and with others. In much the same way as a smart phone, it has all kinds of bells and whistles under it’s bonnet (indeed it needs the bells and whistles of an iPad or tablet to work) but the bit you interact with, the bit that matters to you, is really rather simple. This friendly cube that is soft to touch, with its inviting bumps and curves, has a clear message: touch me. When you touch it, you make amazing sound. And you control that sound. To get you started the Skoog can be tuned to particular scales and this means you have the right notes to play with. 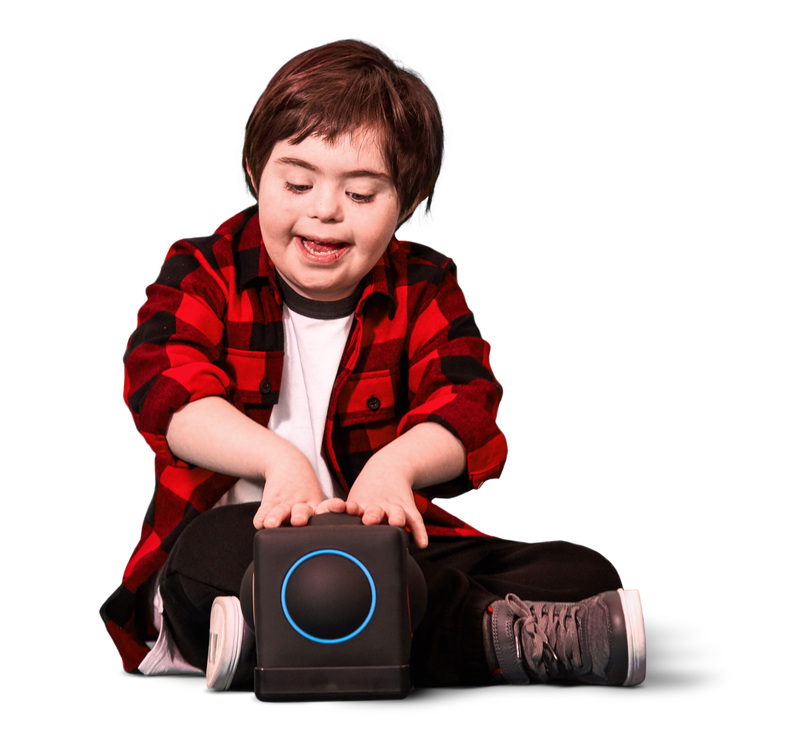 The Skoog has been designed to make music accessible for everyone. It is also suitable for MLD, SLD and PMLD, children with global delay, genetic conditions such as Down’s Syndrome, sensory impairments, physical/medical problems and those with autism for ages 3 and up. Sensitive all over to touch you can even play the Skoog with any part of the body. Simply press, pinch, tap or squeeze the soft, huggable Skoog and start making your own music straight out of the box. Colorful and squeezable, the Skoog is robust and wipe clean. Suitable for all stages of the curriculum. Once you get the hang of it you can pop the training wheels off and hit the Jazz clubs, or just enjoy making music at home. Skoog 2.0 is a tactile music interface and can be purchased online from Apple or for the education market through one of our Education Partners. How can I have a go? To get your very own Skoog 2.0, online or instore at Apple or online on Amazon.